Our signature marimbas are specifically designed for both classroom usage as well as for band purposes as they have a large 3 ½ octave range (from C, 2 octaves below middle C, to G, two and a half octaves above middle C.) They are also extremely easy to transport as the legs fold-up and the bars fit into specially designed bags. The best feature of our signature marimbas is the versatility they offer in terms of key choices. All the bars, although secured by durable elastic to prevent the bars from jumping off the frame, are able to be removed in a flash. This gives the instrument a key versatility without a second chromatic keyboard. If you wish to play in G major, remove the Fs and replace them with F#s. The possibilities are endless. Our marimba range also includes: chromatic add-ons for transforming our signature marimbas into chromatic marimbas; a split combination marimba; a pre-school lower legs combination marimba; a “standard” set of 4 individual marimbas: bass, tenor, soprano and piccolo in C.
All our other marimbas are pitched at A440. This therefore enables you to use the marimbas with all orchestral and other instruments. They blend particularly well with Orff instruments and the bass marimba provides that lovely lower bass sound lacking in the conventional Orff instrumentarium. We also manufacture a range of quality marimba beaters/mallets. 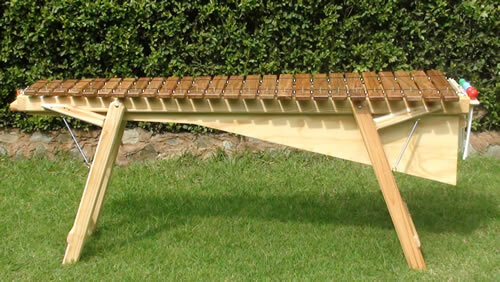 These include perfectly modulated densities to suit the various ranges of our marimbas. New in the range are our GLO-BALL BEATERS which light up at a flick of a switch. This is a first in the world of marimbas! 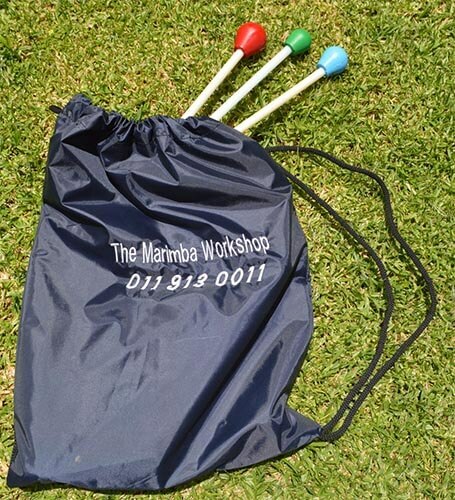 Included in our range of products are storage/transport bags for all the notes as well as brand new in our range are fitted covers for your marimbas. We also have marimba trolleys which move your marimbas around with ease. 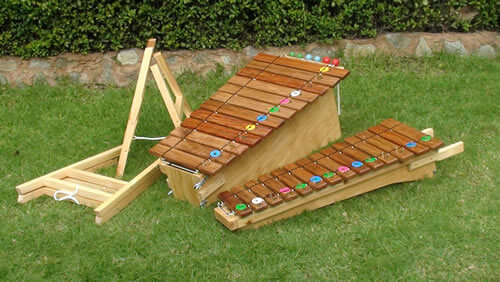 We also are the only distributors of dummy keyboards which are used in the classroom to supplement your marimbas. We also have music available for sale. RANGE:3 ½ octaves beginning on the first C below middle C and extending to G, 2 ½ octaves above middle C. This effectively covers the tenor, soprano and piccolo ranges. BARS: The removable bars are made from kiaat and are electronically tuned. 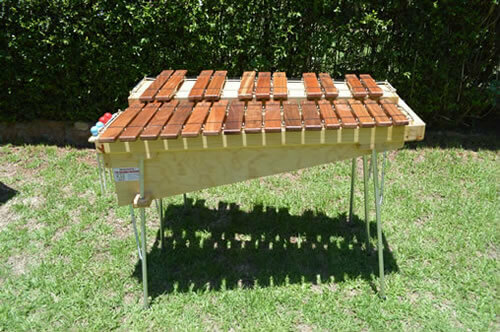 Additional F#s and Bbs are supplied with this marimba. Any other additional chromatic bars are available for purchase. FRAME: The frame and resonating box are made from clear pine and ply and can be stored in an upright position. BEATERS: Three pairs of beaters are supplied in 3 different densities designed specifically for the three ranges found on the marimba. THIS MARIMBA IS DESIGNED TO ACCOMMODATE 3 PLAYERS. RANGE: 2 octaves beginning on the second C below middle C and extending to middle C. This effectively covers the bass and baritone ranges. The removable bars are made from kiaat and are electronically tuned. 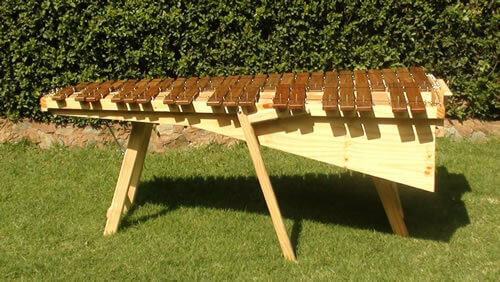 Additional F#s and Bbs are supplied with this marimba. Any other additional chromatic bars are available for purchase. FRAME: The frame is made from clear pine and can be stored in an upright position. RESONATOR BOXES: These boxes can be removed for easy transportation and storage. BEATERS: Two pairs of beaters are supplied. THIS MARIMBA IS DESIGNED TO ACCOMMODATE 2 PLAYERS. 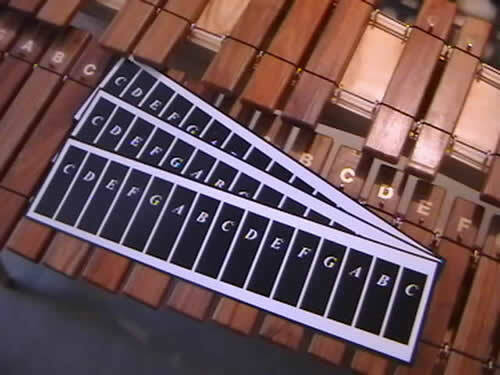 This is a chromatic keyboard that fits onto any existing 3 ½ octave diatonic combination marimba thus transforming a diatonic 3 ½ octave combination marimba into a chromatic combination marimba! RANGE: 3 ½ octaves beginning on the first C # below middle C and extending to F#, 2 ½ octaves above middle C. This effectively covers the tenor, soprano and piccolo ranges. BARS: The removable bars are made from kiaat and are electronically tuned. This is a chromatic keyboard that fits onto any existing 2 octave diatonic bass marimba thus transforming a diatonic 2 octave bass marimba into a chromatic marimba! The bars are angled to facilitate easy playing! RANGE: 2 octaves beginning on the second C# below middle C and extending to middle Bb. This effectively covers the bass and baritone ranges. RANGE: 3 ½ octaves beginning on the first C below middle C and extending to G, 2 ½ octaves above middle C. This effectively covers the tenor, sopranoand piccolo ranges. BARS: The removable bars are made from kiaat and are electronically tuned. Additional chromatic bars are available for purchase. FRAME: The frame and resonating box are made from clear pine and ply. The frame comes in two halves that are attached by canopy clips. This enables the marimba to fit easily into the boot of most cars. 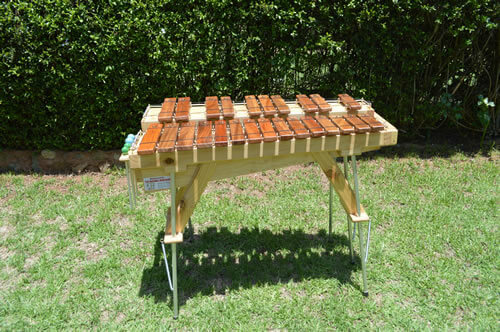 When assembled the marimba sits on two pine trestles which are collapsible into flat form. 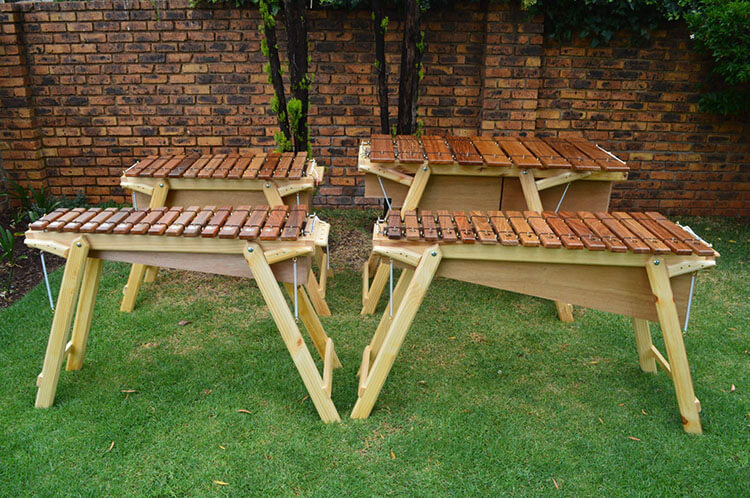 They can be manufactured to the pre-school marimba height or standard marimba height. 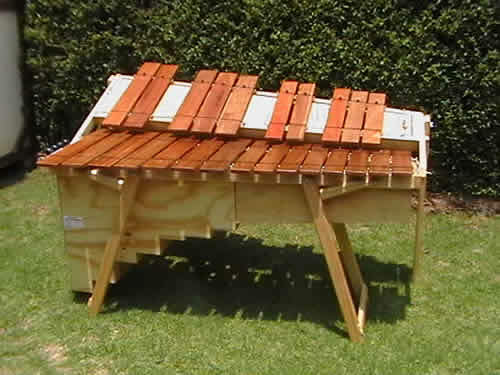 When not in use the marimba can be easily split and stored. 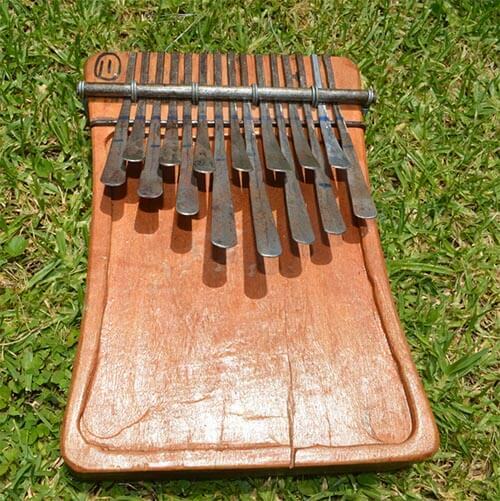 BEATERS: If purchased as part of the “Adventures of Little Brown Monkey” pre-school programme then four pairs* of beaters are supplied in 3 different densities designed specifically for the three ranges found on the marimba. THIS MARIMBA IS DESIGNED TO ACCOMMODATE 3/4* PLAYERS. RANGE: 3 ½ octaves beginning on the first C below middle C and extending to G, 2 ½ octaves above middle C. This effectively covers the tenor, soprano and piccolo ranges. The traditional set of Marimbas includes a Piccolo, Soprano, Tenor and Baritone/Bass. Each of the marimbas in the TRADITIONAL MARIMBA RANGE have removable legs for easy transportation. Transport bags are available for each of the marimbas so that they can be easily transported by air. One bag carries both the marimba and its notes. RANGE: 2 octaves beginning on the first G above middle C and extending to G, 2 octaves above. HEIGHT: Approximately 900mm but can be adjusted to 470mm by removing legs (see picture). 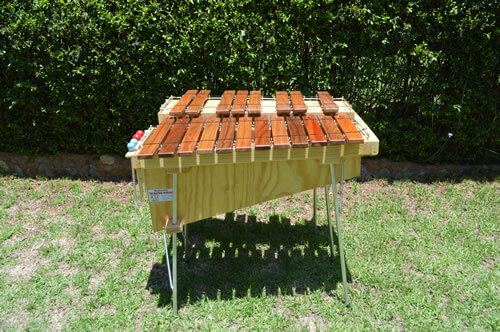 Additional F#s and Bbs are supplied with this marimba. Any other additional chromatic bars are available for purchase. BEATERS: 2 pairs of beaters are supplied in 2 different densities designed specifically for the two octaves found on the marimba. 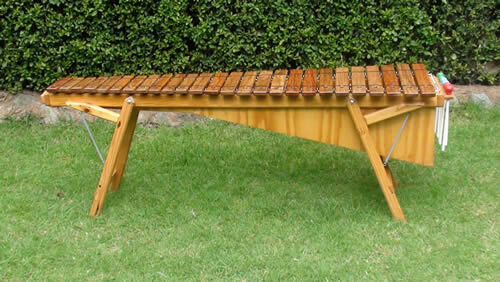 THIS MARIMBA IS DESIGNED TO ACCOMMODATE 1 or 2 PLAYERS. RANGE: 2 octaves + 1 note beginning on the first G below middle C and extending to A, 2 octaves + 1 note above. RANGE: 1 ½ octaves beginning on the first C below middle C and extending to G, 1 octave above middle C.
BEATERS: 1 pair of beaters is supplied. 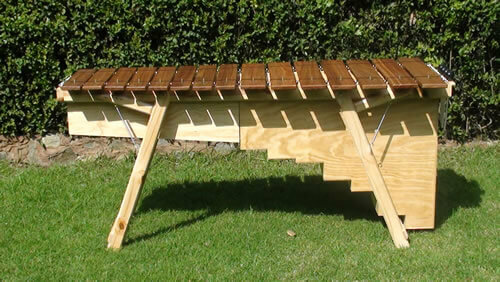 THIS MARIMBA IS DESIGNED TO ACCOMMODATE 1 or 2 PLAYERS. RANGE: 1 octave + 1 note beginning on the second C below middle C and extending to D below middle C. This effectively covers the bass and baritone ranges. BEATERS: One pair of beaters is supplied. THIS MARIMBA IS DESIGNED TO ACCOMMODATE 1 PLAYER. 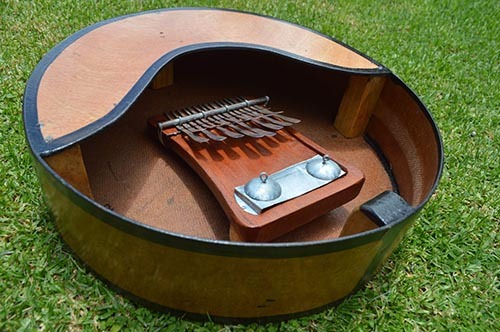 Mbira with no resonating box. A bag to hold your marimba beaters. Our standard range of beaters are made of polyurethane for the heads and a nylon handle. These beaters come in 4 densities perfectly modulated and designed for the various ranges found on our marimbas. These marimba beaters are virtually indestructible. They come inblack for the bass marimba and red for the tenor range, blue for the soprano range and greenfor the piccolo range of the combination marimba. There is a similar range of beaters with wooden handles available. 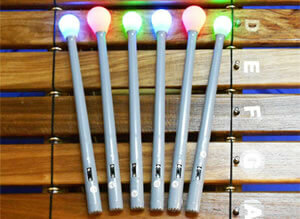 New to the marimba scene world-wide is the latest GLO-BALL BEATERS. At a flick of a switch the beaters light up and make a spectacular effect when playing in the dark or semi-dark! This is a must for all concert players world-wide! The beater-heads can be specifically manufactured for all marimbas not only The Marimba Workshop marimbas provided there is enough of a demand! the Marimba Workshop brings Glow-ball beaters The beater handles are manufactured from high grade polypropyline while still retaining flexibility. The density of the beater heads can be varied and custom-made depending on demand. as well as flashing changing colours. These new beaters are supplied with a mini 12v battery. The battery has an expected lifespan of 40 hours: this gives about 800 3-minute performances per battery! Create magical effects in the dark and semi-dark as you play your percussion instruments. Specially designed durables storage/transport bags for chromatic and diatonic bars are available for all our marimbas. 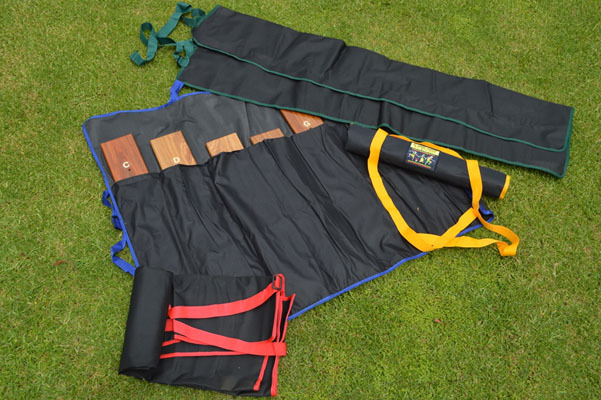 The bags have specific compartments for each of the bars to facilitate easy transference onto the marimbas. These are a “must” if you are going to do gigs with your band. 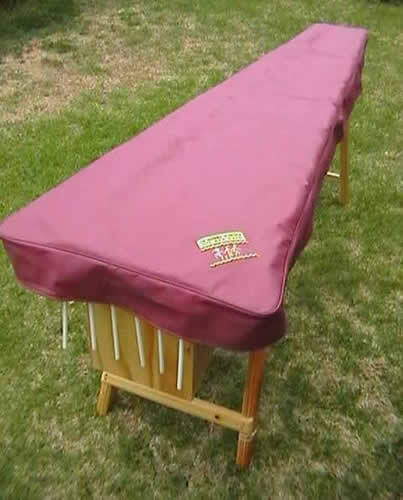 These are beautifully designed covers for your marimbas to keep them in tip top shape when not in use. Your school logo and name can be added to personalize the covers. This is a trolley on castors on which the marimba sits thus enabling the marimba to be wheeled around with ease. These are laminated sheets of cardboard with a keyboard layout of a marimba printed on them. 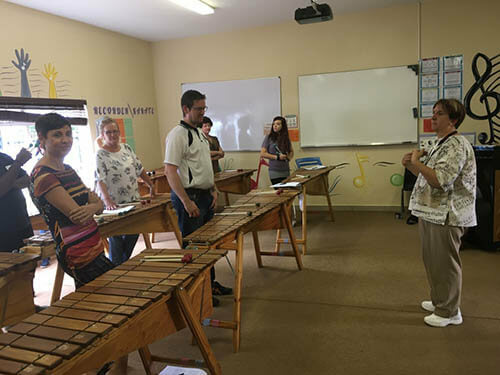 Complement your marimbas with these dummy keyboards so that every child in your classroom is actively involved in the learning process. 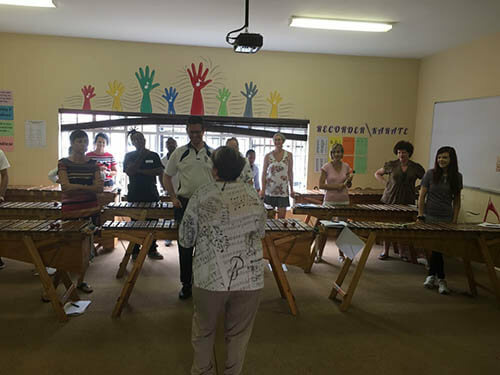 Rotate the learners constantly and within a very short space of time every learner is able to play a marimba. Attend one of our workshops to see how effectively this works! 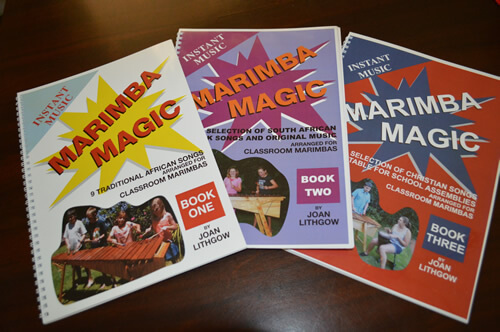 “MARIMBA MAGIC” BOOK 1: 9 traditional African songs arranged for classroom marimbaswritten by Joan Lithgow and published in 2006 provides a wonderful resource for teachers who are starting out on the magical journey of marimba playing. This book not only provides instant music to play on marimbas but also excellent advice on teaching marimbas in the classroom, how to use dummy keyboards effectively, memory joggers, basic technique used to play marimbas, care of marimbas as well as “teaching notes” on each of the 9 pieces. 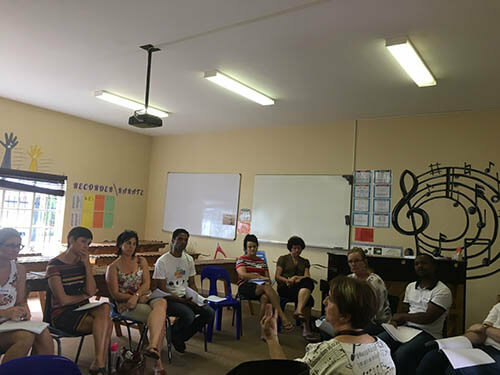 “MARIMBA MAGIC” BOOK 2: A Selection of South African folk songs and original music arranged for classroom marimbas by Joan Lithgow and published in 2008 is yet another resource that is being used world-wide in the teaching of marimbas. The format is the same as book one and is full of useful material aimed at the beginner classroom marimba band. “MARIMBA MAGIC” BOOK 3: A SELECTION OF CHRISTIAN SONGS SUITABLE FOR ASSEMBLIES ARRANGED FOR EASY CLASSROOM MARIMBAS by Joan Lithgow and published in 2013 is the latest in the MARIMBA MAGIC SERIES and is proving to be a favourite amongst marimba teachers. The arrangements are easy but very effective.